Who Needs a Cape shows you how she made 40 Crockpot Meals for the Freezer in 4 hours. Find more Crockpot Freezer Cooking recipes here and check this post on how one afternoon of chopped resulted in 14 freezer meals. « Q&A: How do I stock our pantry on a limited grocery budget? Thank you so much for this post! I was thinking last night that I needed to bring down my crockpot and challenge myself to making dinner in it. Thank you so much. 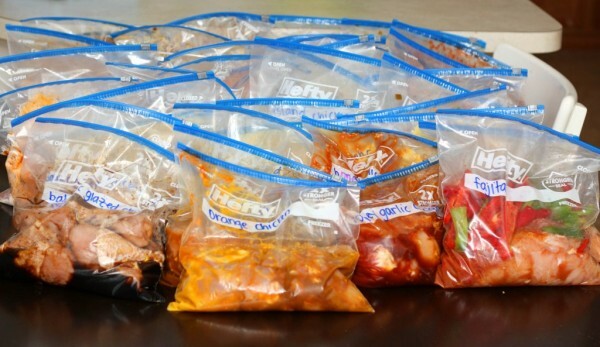 I love the idea of prepping recipes for the crockpot ahead of time. I will definitely be bookmarking that article. I just did a round of 6 recipes during hurricane Sandy. Wow, soooo useful! I’m excited to try more! We have a friend whose son has cancer. Will be using this to try to help her manager her life during his treatment. Does anyone know if these crockpot meals could go into a Power Cooker XL instead? It’s a big, digital pressure cooker.